Mumbai: At Hyderabad’s upmarket Banjara Hills, luxury hotel Taj Deccan is overhauling five of its banquet halls. Coming up in its place in three months: A 200-seat co-working space, spread across over 6,000 sq. ft.
Up north in Gurgaon, French hospitality group AccorHotels is looking to convert a tenth of the rooms at its Formule 1 budget hotel to office space. As a pilot, it has converted one room into office space and plans to convert 10 more depending on demand. Meanwhile at Orchid, a luxury hotel near the Mumbai airport, the management is in talks to sub-let some of its unutilized space for office use. Hoteliers like these and many more are looking to make their underutilized space work by converting them into office areas, tapping growing demand for office space. K. Mohanchandran (director, operations) at TajGVK Hotels & Resorts Ltd which operates Taj Deccan, said the office spaces are an extension of its business centres, providing an opportunity to get new guests into the hotel. “At times during the low season, we definitely find ways and means to getting ourselves to more people. You change your strategy according to the inflow and the kind of demand that comes. It definitely helps in low season and (offers) visibility to the masses,” Orchid’s general manager Varun Sahani said. Sumit Lakhani, chief marketing officer at Awfis Solutions Pvt. Ltd that is helping Taj Deccan and AccorHotels rework empty spaces as office areas, said such conversions create an additional revenue stream for the hotels. “The general occupancy in most hotels is around 90% in a good season and at any given time, 10% remains unoccupied. For hotels, it gives an assured business revenue and additional business with the corporate firms,” Lakhani said. Awfis runs 13 co-working office centres with 3,000 seats, and plans to add another seven centres with 2,000 seats by December. It said it is in talks with AccorHotels to convert space at seven Formule 1 hotel properties. AccorHotels declined to comment. “This trend obviously happens when the revenue is tilted towards office rentals and in good locations where quality office spaces are not available anymore. In such situations, because of high demand, rentals also shoot up. So, in such situation, it is better return-wise for the hotels to actually put a few rooms for office,” said Gulam Zia, executive director (advisory, retail and hospitality) at Knight Frank, a property consultant. “Everybody is re-looking at their portfolios and how they can best monetize their real estate assets including hotels. We have an existing partnership with Ibis Hotel in Bengaluru. We do talk to a lot of developers including hotels who would be interested in terms of having a partnership with Regus,” said Harsh Lambah, country head at Regus India, a global workplace provider. Though returns are not high, he said it makes business sense and is a “good fit” to open within a hotel property as customers can use the facilities provided by the hotels. Regus operates about 93 business centres across 17 cities in India. Mumbai: Shopping malls, particularly underperforming ones, are becoming a favourite destination for setting up shared office spaces. Cheaper rentals, availability of large spaces and easier access to recreational facilities in shopping complexes are luring co-working office providers to malls. For co-working office providers such as Awfis Space Solutions Ltd, IWG Plc, The Hive and SmartWorks, shopping complexes provide one of the fastest and efficient ways to open co-working offices. Apart from getting attractive deals, such retail destinations offer the right setting for an informal environment, a theme most co-working spaces thrive on, said executives of these companies. Shared office provider SmartWorks Ltd is in the process of converting Pune’s Central Mall, which has been shut for the past two years, into a co-working office. Nitesh Sarda, founder, SmartWorks, said the company is currently in talks with more than 20 landlords of the 120,000 sq. ft shopping complex to convert it into a co-working office. He expects to start work on the complex in two-three months. “Firstly, malls are now open to the idea of converting into a commercial space. There are a lot of collaborative areas that are designed in a mall which is quite attractive. Location is a big factor and some of the older malls are located right in the residential pocket,” said Sarda. 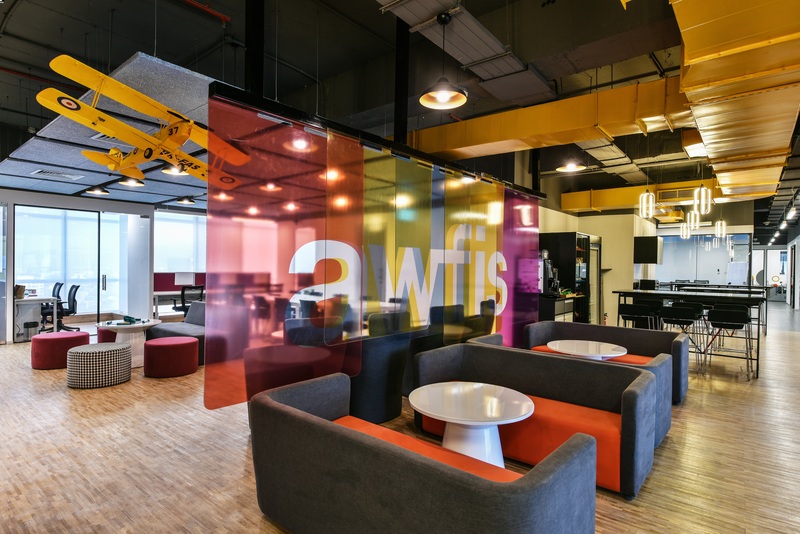 Awfis Space Solutions has opened co-working offices at five shopping malls in Mumbai, Pune and Gurugram. The firm has chosen malls where footfalls have significantly dropped in 2-3 years or are under-utilized areas in a shopping complex to open shared office spaces. For instance, Awfis operates a 30,000 sq. ft co-working office on the sixth floor of Ambience mall at Gurugram. Besides, it has also opened centres each in Raghuleela and Heera Panna mall in Mumbai and Nucleus mall in Pune. According to Sumit Lakhani, chief marketing officer, Awfis, the higher floors of mall which are less popular among retailers provide an attractive deal to set up such shared offices. “The rental difference between ground floor and higher floors is 35-40%. Access to parking spaces and security system are also well taken care off. Besides, most malls are generally located in some of the best locations around,” he said. Luxembourg-based International Workplace Group (IWG) operates four Regus business centres out of shopping complexes in Delhi, Noida, Bengaluru and Chennai. It has also recently opened a co-working office under the brand SPACES at City Centre mall in Chennai. “Co-working is still looked at as an informal work space. Several firms may not like to associate with a mall as a workplace but for a co-working office, malls provide the right setting. 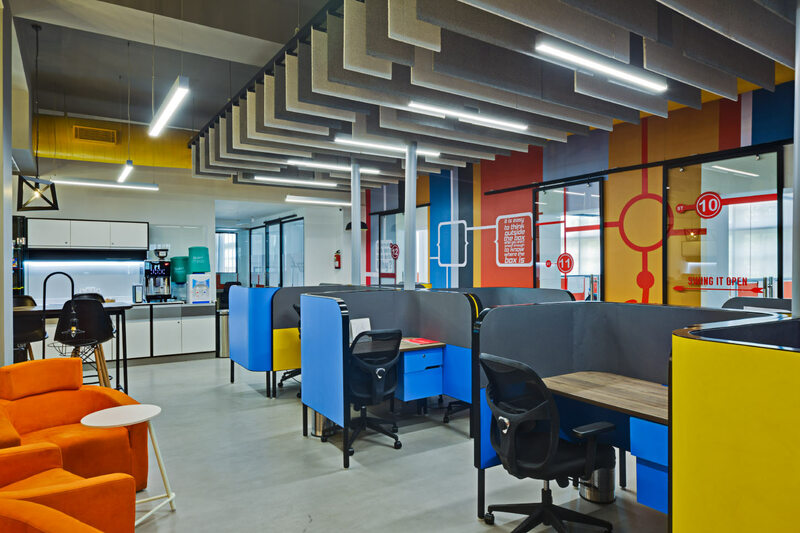 Abundant parking spaces, along with a good amount of food and beverage areas within a mall, becomes a good fit for setting up co-working offices,” said Harsh Lambah, country manager (India), IWG. For developers, leasing out to such office providers allows them to utilize areas in a shopping mall that are less popular among retailers. “A mall makes a whole lot of sense for co-working office providers. They don’t have to invest anything on food, entertainment and other facilities. Besides, for malls, it provides captive customer inside a mall,” said Pankaj Renjhen, chief operating officer, Virtuous Retail, part of private equity firm Xander Group. Xander’s co-working office venture, The Hive, operates two centres at its two VR malls in Bengaluru and Chennai. Amit Ramani says we decided to build centres with a capacity of 350-400 seats, to facilitate community interaction and enable members to collaborate, exchange ideas and create a productive work environment. There was one moment when fate turned their way, a moment that they can look back upon and say, that was when it started. Awfis Space Solutions, a start-up that provides shared workspaces, has raised $20 million from Sequoia Capital India to fund its expansion plans. Awfis, which operates 21 workplaces across the National Capital Region (NCR), Bengaluru, Mumbai, Hyderabad, Pune and Kolkata, will use the funds to expand to more than 100 centres in two years, the firm said. It plans to raise the total seat count in its centres to 35,000 from about 7,500 now. Sequoia’s investment displays the growing investor interest in the area of shared offices, which has seen a number of branded co-working facilities mushroom in metropolitan cities in the past few years. Currently, the biggest entities in the segment are 91springboard (present in NCR, Hyderabad, Mumbai and Bengaluru), Y Combinator-incubated Innov8 (Delhi, Chandigarh and Bengaluru) and InstaOffice (Gurgaon, Bengaluru and Delhi), besides smaller region-only firms like CoWork India (Bengaluru), AltF Coworking (Delhi and Gurgaon) and Blume Ventures-backed BHIVE (Bengaluru). 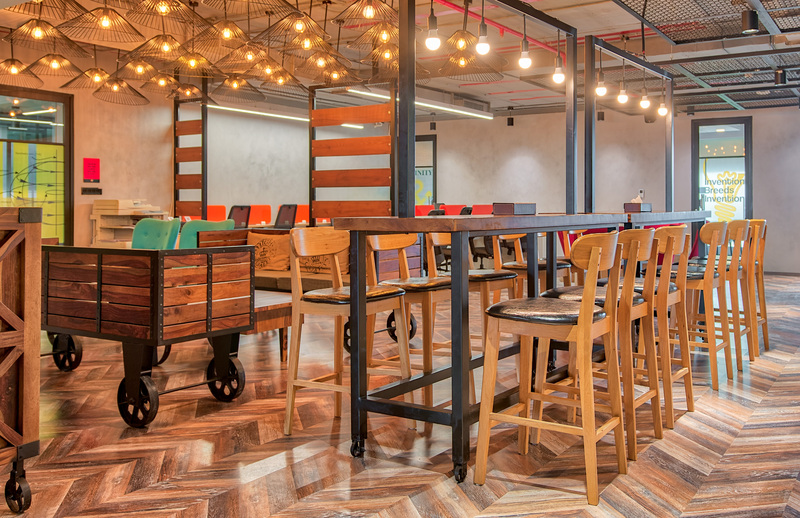 WeWork, a leading shared workspace provider with a presence in 15 countries, has also entered the subcontinent. The New York-based firm will open its first centre in Bengaluru this year and has leased a 16-storey building, representing almost 190,000 sq. ft area, in Mumbai’s Bandra Kurla Complex, Mint reported in January. Awfis, which opened its first facility in Delhi in 2015, is a joint venture between Amit Ramani, the founder and managing director of real estate design consulting firm Nelson India, and The Three Sisters: Institutional Office, a family-run investment firm managed by Yes Bank founder Rana Kapoor’s daughters. Both parties had invested $11 million in Awfis in April 2015. Awfis has since expanded its footprint to six of the eight metros in India, with a facility in Chennai expected to come up in three months, CEO Ramani said. He said the focus is to place smaller co-working centres in the vicinity of the user rather than to have fewer big facilities. “We have identified a sweet spot of 350-400 seats per centre, where our unit economics works and this kind of scale gives us the best-suited setting for a community-based environment,” Ramani said. Awfis co-working centres are typically of the size of 15,000-20,000 sq. ft. and offer facilities like high-speed internet, video conferencing and printing and have cafeterias. The space is rented out on a per-seat per-month basis. One seat is priced at Rs3,500-5,500 under the flexi plan (where the seat position is not defined) and Rs8,500-10,000 for a fixed seat. A seat in a private cabin starts at Rs13,000; besides clients have the option of booking an entire cabin or meeting room. Awfis takes a property on lease typically for a five-nine year period and invests in its renovation and refurbishment. It has also deployed what it calls a ‘managed aggregation model’ wherein the property owner offers its property to Awfis for no upfront cost and takes a higher share of the revenue. Ramani said that over 50% of its facilities are on the latter model and expects to sign up at least 70-80% of the new properties on this model. He claims that Awfis spaces see about 90% occupancy.